While the question of whether the Brownhill Creek Detention Dam is to become part of the flood mitigation project or not goes back out to the public for their comment early next year Unley in the meantime has commenced construction of their detention dam in Ridge Park. 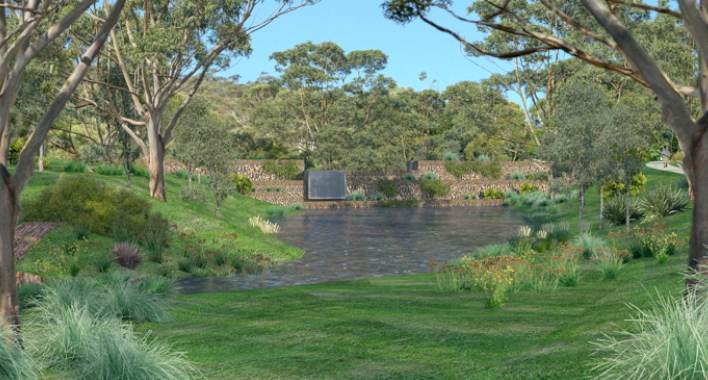 After an exhaustive tender assessment process, the contract to undertake the construction of the storm water detention dam in Ridge Park was awarded to South Australian company, York Civil on 29th October 2014. The contract is expected to be finished in June 2015. The contractor was officially permitted to begin work on site from the 10th November. Since that time, the contractor has been submitting various project plans required under the terms of the contract as well and holding of a number of start up meetings with Council’s representatives. Work on site has involved surveying of the site, establishment of fencing to protect park users from construction activities and the removal of vegetation in accordance with all relevant approvals. Site offices have just been erected in the tennis court area. During this current week, York Civil will be bringing the plant and equipment to be used in construction to the site. Vegetation removal will also be completed. The site crew will arrive and complete the installation of environmental controls such as erosion protection measures and setting out the works. Earthworks to create the foundation for the dam are expected to commence the following week. Information regarding the project has been revised to reflect that construction is imminent. This has included updating Council’s website as well as installing information signs around the site. Parking restrictions have been put in place on Barr Smith Avenue to ensure the safety of home owners and park users whilst construction vehicles commence using this street as the main access to the site. Modifications to the times that parking is banned will occur to take into consideration some the concerns of residents and park users.